The progress of nanogenerator-based self-charging energy storage devices is summarized. The fabrication technologies of nanomaterials, device designs, working principles, self-charging performances, and the potential application fields of self-charging storage devices are presented and discussed. Some perspectives and problems that need to be solved are described. One significant challenge for electronic devices is that the energy storage devices are unable to provide sufficient energy for continuous and long-time operation, leading to frequent recharging or inconvenient battery replacement. To satisfy the needs of next-generation electronic devices for sustainable working, conspicuous progress has been achieved regarding the development for nanogenerator-based self-charging energy storage devices. Herein, the development of the self-charging energy storage devices is summarized. Focus will be on preparation of nanomaterials for Li-ion batteries and supercapacitors, structural design of the nanogenerator-based self-charging energy storage devices, performance testing, and potential applications. Moreover, the challenges and perspectives regarding self-charging energy storage devices are also discussed. With the rapid development of economy and society, microelectronic devices are playing an increasingly important role in our daily lives. Usually, these devices can be powered using lithium-ion batteries or supercapacitors, which require external power sources to periodically charge them due to their limited capacities [1, 2, 3]. Moreover, it will cost a significant quantity of manpower, financial resources, and time, especially in remote areas. For power supply, scientists are researching new methods of scavenging clean energies from the surrounding environment [6, 7, 8, 9, 10]. Based on this background, the piezoelectric and triboelectric nanogenerators were invented by Wang et al. in 2006 and 2012, respectively [4, 5], which can effectively convert small mechanical energy into electrical energy in the ambient environment, such as wind energy [6, 7], wave energy , droplet energy , and other mechanical energies . They are clean or wasted energies in our surrounding environment. Nanogenerators not only can effectively scavenge mechanical energies mentioned above, but also have several advantages such as simple, small, light, low cost, no auxiliaries, and convenient. They can be applied to wireless sensors and microelectronics devices. Currently, research and development of self-powered electronic devices have become a hot topic among scientists [11, 12, 13, 14, 15, 16, 17, 18, 19, 20, 21, 22, 23, 24, 25, 26, 27, 28]. 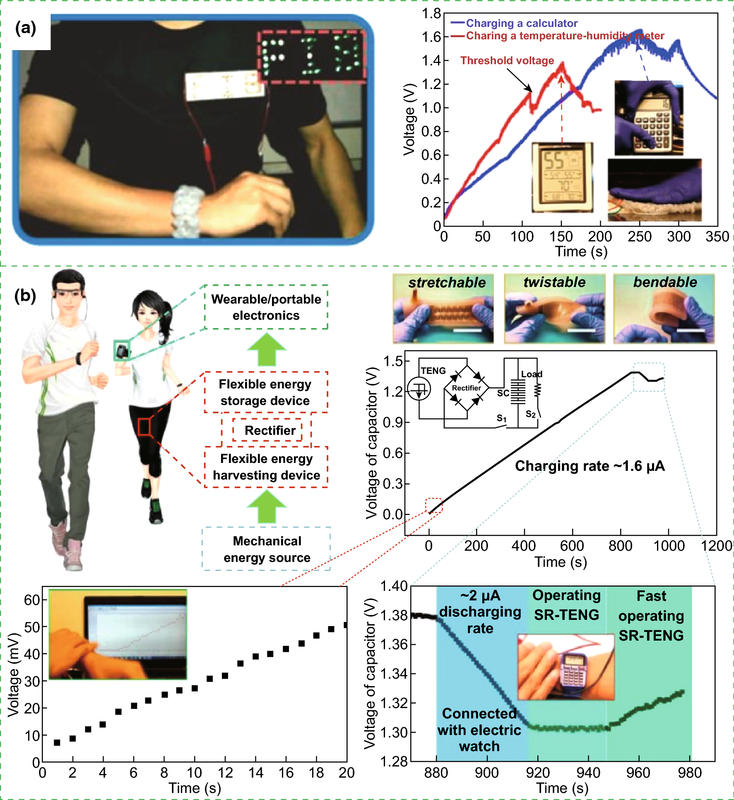 In particular, remarkable progress has been made in the field of self-charging power textile for wearable electronics [29, 30, 31, 32, 33]. Thus, it is important to investigate self-charging energy storage devices that can effectively integrate energy harvesting and storage units in one device for powering some small electronic devices with sustainable energy supply. Nanomaterials can not only be used as positive and negative electrode materials, but also be used as special electrolytes or separators. In 2017, He et al. 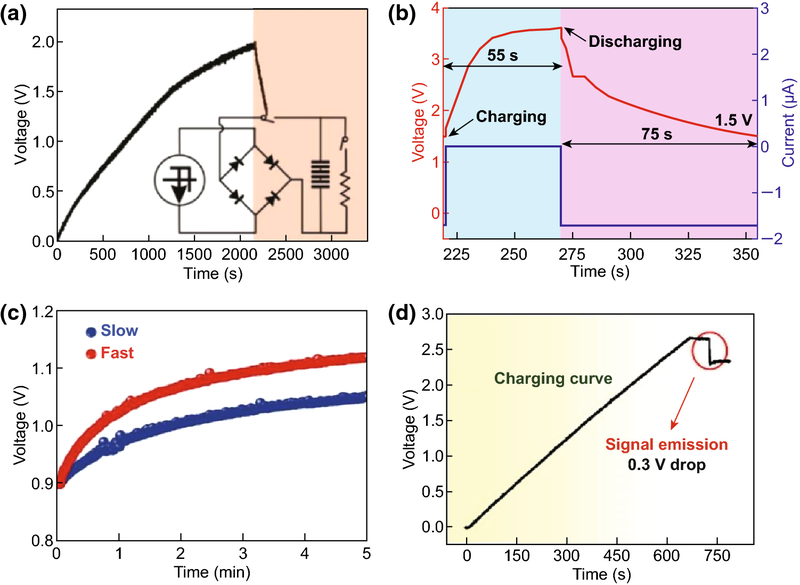 fabricated a novel all-solid-state self-charging power cell (SCPC) using mesoporous polyvinylidene difluoride (PVDF)–LiPF6 film as piezoelectrolyte . The morphology and microstructure of SiO2 and PVDF film are presented in Fig. 1a, demonstrating that the average diameters of SiO2 are approximately 200 nm, and the pore size and thickness of PVDF film prepared using SiO2 as template are 200 nm and 1 μm, respectively. 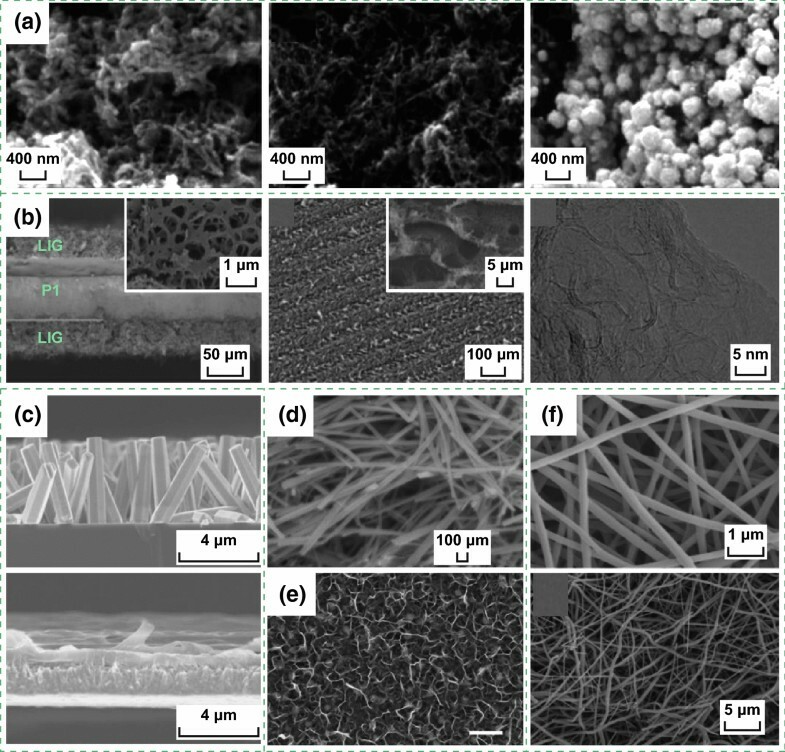 Figure 1b presents that a PVDF–PZT (Lead zirconate titanate) nanocomposite film and multi-walled carbon nanotubes (MWCNTs) have been used as a piezo-separator and negative material in SCPC . It can be distinctly observed that the thickness of the PVDF–PZT nanocomposite film is approximately 60–110 μm; the MWCNTs have lengths of 5–15 µm and diameters of 40–60 nm, respectively. Kim et al. designed a SCPC consisting of LiCoO2 nanomaterials as the cathode and artificial graphite as the anode with a porous ZnO-free PVDF separator , as illustrated in Fig. 1c. Figure 2a displays that the nano-polyaniline/carbon nanotube (PANI/CNT) and nano-polypyrrole (PPy)/CNT were utilized to fabricate a hybrid electric power device (HEPD) . The porous multilayer structures of laser-induced graphene (LIG) electrodes were used to fabricate the TENG and micro-supercapacitor, as depicted in Fig. 2b . As illustrated in Fig. 2c, ZnO nanowire (NW) arrays and PVDF mesoporous nanostructured films have been used in a piezo-driven SCPC . Ramadoss et al. 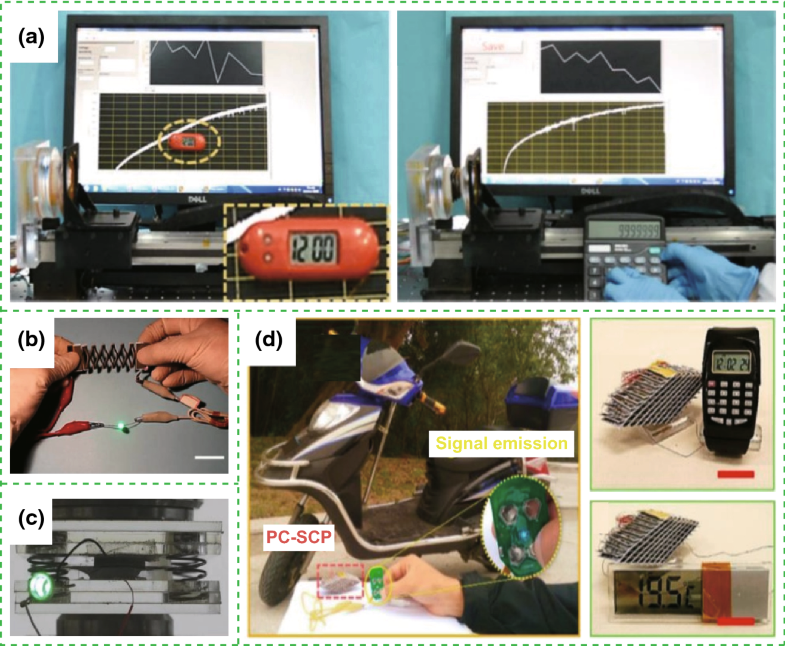 fabricated a piezoelectric effect-driven self-charging supercapacitor power cell (SCSPC) using MnO2 NWs as positive and negative electrodes (Fig. 2d) and a PVDF–ZnO film as a separator . Luo et al. successfully applied 3D Au@MnO2 nanocomposites into the transparent and flexible self-charging power film (SCPF), as exhibited in Fig. 2e . 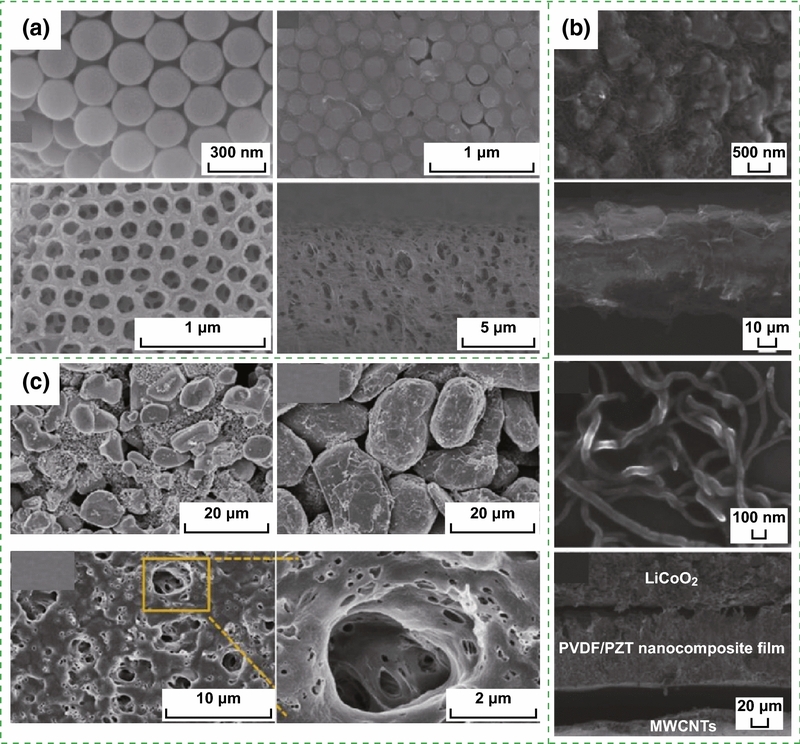 Figure 2f displays the morphology of LiMn2O4 precursor NWs and carbon NWs by electrospinning and annealing calcinations, where the LiMn2O4 precursor NWs exhibit smooth surfaces with diameters ranging from 150 to 260 nm and lengths of approximately several tens of micrometers. The polyvinylpyrrolidone NWs were oxidized under air atmosphere and then were carbonized under Ar protection at 850 °C to obtain conductive carbon NWs as the anode of Li-ion batteries (LIBs) . Zhao et al. developed a new strategy for fabricating a metal–organic framework (MOF) for the template-directed growth of hierarchically well-oriented NW arrays based on carbon nanotube fibers (CNTFs) for electrochemical supercapacitors, where the corresponding SEM images of the MOFs, MOF derivatives, and CNTFs materials are illustrated in Fig. 3a . Researchers have prepared CuO nanoflake arrays, hierarchical NiCoOH nanoplies and reduced graphene oxide (RGO) nanosheets for energy storage devices. As displayed in Fig. 3b, a uniform and homogeneous growth of CuO nanoflake arrays with an average thickens of 35–45 nm on Cu foil substrate and the 3D architectures of NiCoOH nanoplies with an average wall thickness of 50–70 nm were successfully deposited on CuO@Cu foil, and the wrinkled sheets of RGO with an average thickness of 30–40 nm were evident . The all-solid-state symmetric yarn SC was fabricated using dip-coating carbon nanofiber (CNF) and poly(3,4-ethylenedioxythiophene)-poly-(styrenesulfonate) (PEDOT: PSS) on a carbon fiber (CF) bundle, as depicted in Fig. 3c . Wen et al. 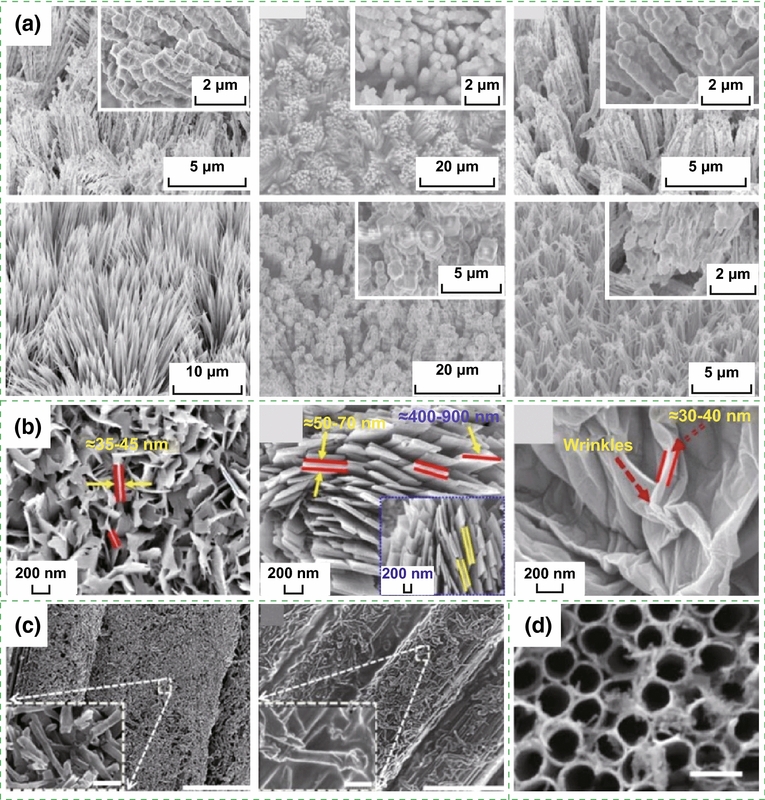 used highly ordered TiO2 nanotube arrays in F-DSSC, as illustrated in Fig. 3d . The SCPC was fabricated using PVDF/0.5(Ba0.7Ca0.3) TiO3–0.5Ba(Zr0.2Ti0.8)O3 (BCT–BZT) nanocomposite as piezo-separator . Two-dimensional materials have excellent properties, such as open ion diffusion channels and abundant active surfaces that enable fast transport and storage ions. Therefore, it is very important for self-charging energy storage devices. Pazhamalai et al. fabricated the SCSPC using 2D-MoSe2 nanosheets as the electrodes, PVDF-co-HFP/TEABF4-based ionogel as the electrolyte, and the electrospun PVDF/NaNbO3 nanofibrous mat as piezo-separator . Currently, LIBs and supercapacitors are widely utilized as the main electrochemical energy storage devices. They can be used as the energy supply units for powering mobile phones, personal wearable devices, microelectronic devices, etc. The reported self-charging energy storage devices are mainly based on LIBs and supercapacitors. These devices can collect and convert mechanical energy into electric energy in the surrounding environment, and then store the scavenged energy as chemical energy. Energy scavenging function of the devices can be realized by piezoelectric nanogenerators or triboelectric nanogenerators. Figure 4a–d depicts the self-charging energy storage devices based on the piezoelectric effect [11, 17, 21]. The mesoporous PVDF–LiPF4 film (Fig. 4a, b) and PVDF–ZnO film (Fig. 4c) are used in the device, where a PVA–KOH gel electrolyte-soaked perforated fish swim bladder (Fig. 4d) was used as piezoelectric separator. Meanwhile, the flexible self-charging energy storage devices using piezoelectric nanogenerator have been developed. Yuan et al. reported a paper-based flexible SC using PANI/Au/paper as electrodes, which can be charged by a piezoelectric generator . The voltage of six SCs connected in series can be charged to 2.6 V in approximately 11 h; they could power a blue LED for 5 min. As presented in Figs. 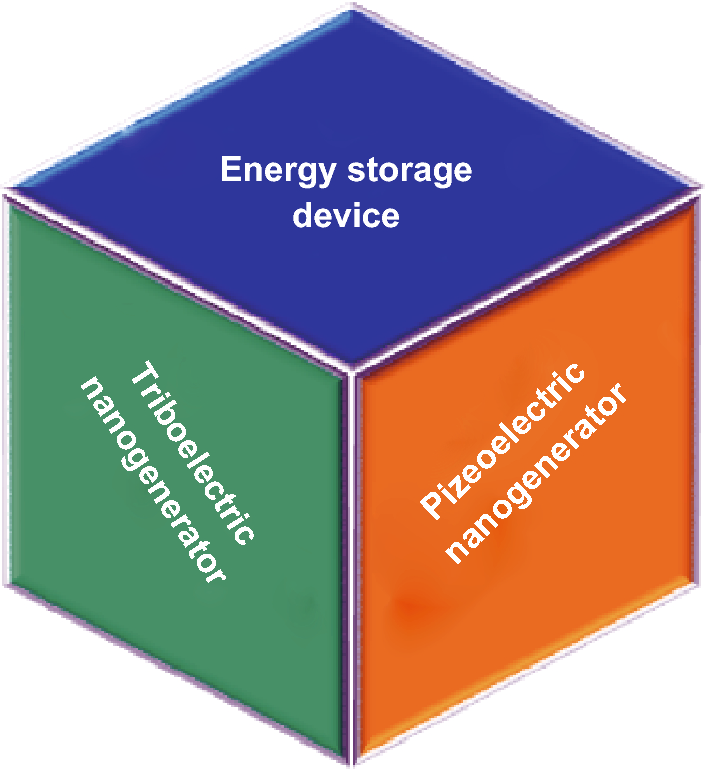 5a–f and 6a–d, the LIBs and supercapacitors were based on triboelectric nanogenerators [18, 19, 20, 21, 22, 23, 24, 25, 26, 27, 28]. 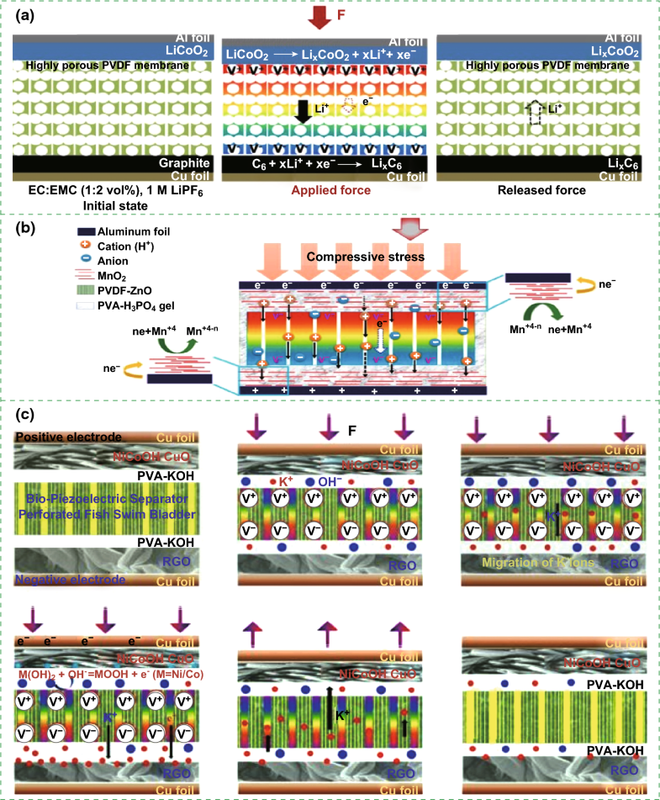 Figure 5a displays the schematic diagrams of all-solid-state transparent and flexible supercapacitors (TFSCs) based on interdigital electrodes of 3D Au@MnO2 nanocomposites, which were connected to form an array on the backside of the nanogenerator . The flexible LIBs based on electrospun LiMn2O4 NWs as cathode and carbon NWs as anode are presented Fig. 5b . 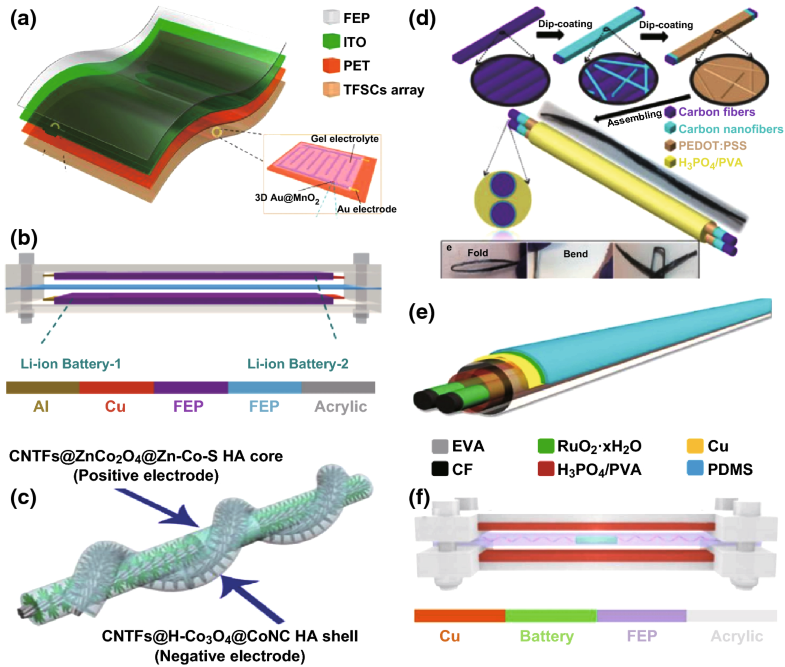 Figure 5c displays the schematic diagram of flexible fiber-shaped coaxial asymmetric supercapacitors, where it was assembled by twisting together the CNTFs@ZnCo2O4@Zn–Co–S positive electrode (core) and the CNTFs@H–Co3O4@CoNC HA negative electrode . Dong et al. fabricated the all-solid-state symmetric yarn supercapacitor (SC) using dip-coating carbon nanofiber (CNF) and poly(3,4-ethylenedioxythiophene)-poly-(styrenesulfonate) (PEDOT:PSS) on a carbon fiber (CF) bundle, as presented in Fig. 5d . Figure 5e illustrates that the fiber-shaped SCs (F-SCs) were fabricated using RuO2·xH2O-coated carbon fibers and PVA/H3PO4 gel electrolyte . Gao et al. 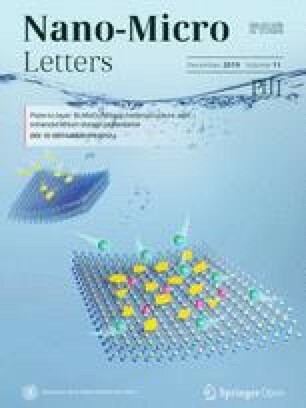 reported a novel strategy of implanting a solid Li-ion battery (SLB) into a triboelectric fluorinated ethylene propylene (FEP) film of TENG to simultaneously scavenge and store wind energy as chemical energy, where the SLB was prepared using the counter rolling mechanism in the order of the anode, PEO–LATP membrane, and cathode, as displayed in Fig. 5f . Figure 6a presents that three EP-TENGs connected in parallel were integrated with three EP-SCs connected in series to create a self-charging power system, where the conductive carbon paper acted as capacitive materials, while the PAN paper served as separator . 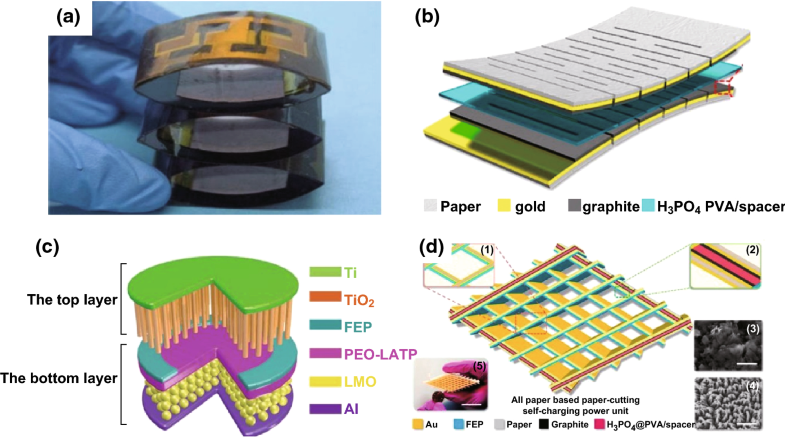 The flexible paper-based supercapacitor is displayed in Fig. 6b, where the graphite, H3PO4/PVA, and kirigami were utilized as the active material, electrolyte, and separator, respectively . Liu et al. reported a convoluted power device by internally hybridizing a TENG and an SLB by sharing common electrodes. The SLB consists of TiO2 nanotubes as anode, the polyethylene oxide-Li(1+x)Ti(2−x)Alx(PO4)3 (PEO–LATP) as solid electrolyte, and the LiMn2O4 nanoparticles as cathode (Fig. 6c) . Figure 6d presents the schematic diagram of the all-paper-based cut-paper self-charging power unit (PC-SCPU), where it can be distinctly observed that the supercapacitor is composed of graphite as active material and H3PO4/PVA as electrolyte . There are two typical charging principles of self-charging energy storage devices. One is based on piezoelectric potential-driven electrochemical oxidation and reduction reaction. 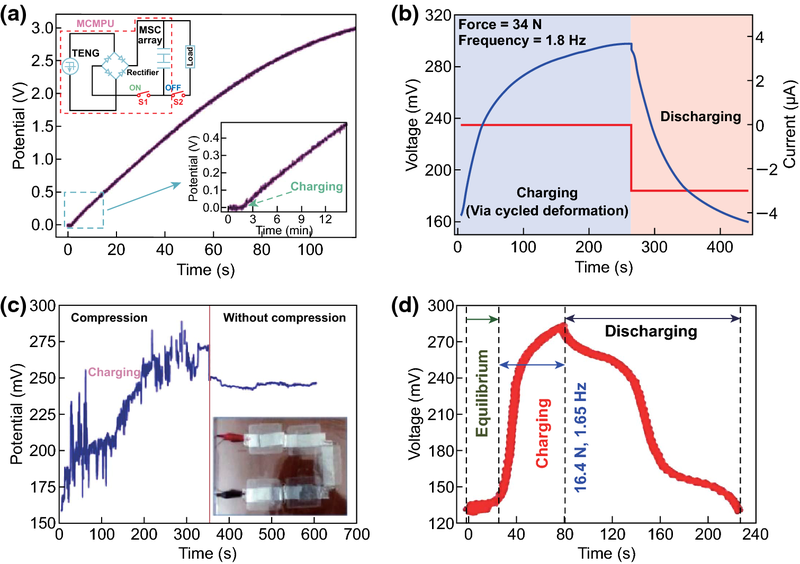 For piezoelectric nanogenerator-based self-charging lithium-ion batteries, the piezoelectric field created by the PVDF piezo-separator forms along the z-axis from the cathode side of the system when compressive force is applied to the battery surface. The piezoelectric potential of the porous PVDF separator causes Li+ ions to migrate from the cathode to the anode through ion-conducting separator and electrolyte, resulting in the incorporation of Li+ ions into the anode electrode. An electron can take the same pathway to maintain charge neutrality, where this migration represents complete conversion of mechanical energy into electrochemical energy, as displayed in Fig. 7a . For piezoelectric nanogenerator-based self-charging supercapacitors, since no pressure force is applied to the device, there is no electrochemical reaction due to the electrochemical equilibrium between the electrodes and electrolyte. A compressive stress can be caused by the polarization of the separator (PVDF–ZnO or BPES, Fig. 7b, c) due to the piezoelectric effect. Moreover, the separator produces a potential difference along the thickness direction. These positive and negative piezoelectric potentials were generated at the top and the bottom of the film, driving the electrolytic ions to move toward the positive and negative electrodes. The piezoelectric field induced cationic movement in the electrolyte to screen the generated piezopotential across the separator. This ionic movement induces an electrochemical imbalance in the electrolyte and the positive/negative electrodes. 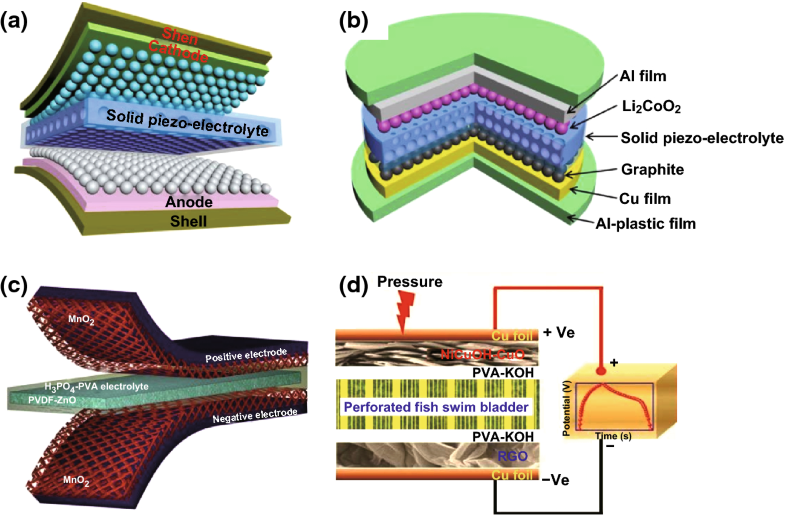 As a result, the positive and negative potentials were developed on the upper and lower surface of the separator that can drive the electrolyte ions toward the different electrodes. The charging process can be continued to accomplish equilibrium of the two electrodes with the generated piezoelectric potentials. The devices directly convert the mechanical energy into electrochemical energy in the SCs, as presented in Fig. 7b, c [17, 21], respectively. Another charging principle is based on triboelectrifcation. Firstly, a TENG can be utilized to convert mechanical energy into electric energy, and then a bridge rectifier is used to convert the generated AC current of TENG into direct current signals before charging the energy storage devices, as displayed in Fig. 8a . The electrical outputs generated by TENGs have the characteristics of high voltage and low current signals. Usually, a transformer is used to decrease the voltage and increase the current before rectifying, as displayed in Fig. 8b–d [19, 25, 27] or by adding a power management circuit between the TENGs and energy storage devices to reduce the voltage, increase the current, and turn the AC into DC signals . More importantly, Fig. 8c, d displays the self-charging process of the LIBs that can simultaneously generate and store electric energy by itself, which is an important step toward next-generation LIBs for pushing the practical applications in self-powered electronic devices. The mechanical energy scavenged from environment using nanogenerators can be converted into electricity, which can be then stored in the energy storage devices such as lithium-ion batteries or capacitors using a management circuit. In this process, energy conversion efficiency and self-charging performance are undoubtedly critical parameters. Figure 9a presents the self-charging curves of the all-solid-state SCPC under periodically applied compressive deformations. When a compressive force of 30 N was applied onto the SCPC at the frequency of 1 Hz, the voltage of the SCPC increased from 25 to 473 mV within 240 s, which can be discharged back to its original voltage in 85 s under a constant current of 5 μA. The obtained corresponding capacity of the SCPC is approximately 0.118 μAh . 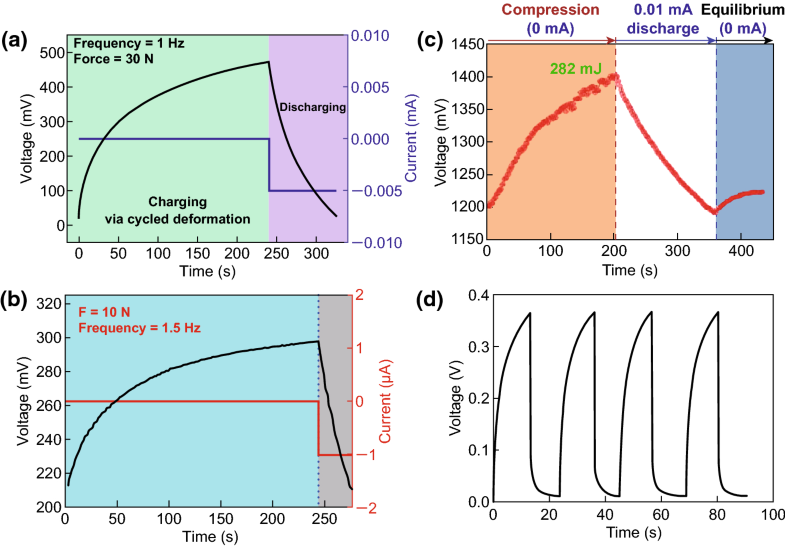 With a compressive force of 10 N applied to the SCPC based on the PVDF–PZT nanocomposite film at a frequency of 1.5 Hz, the voltage of the device can be increased from 210 to 297.6 mV in 240 s. The device was discharged back to its original voltage in 37 s under a constant discharge current of 1 µA, as depicted in Fig. 9b . Figure 9c presents the voltage change curves of the coin cell in the self-charging and discharging processes. When a compression mechanical energy of 282 mJ was applied on the cell at a frequency of 1 Hz, the voltage of the device can be increased from 1.2 to 1.4 V in approximately 200 s. After achieving the self-charging process, the cell was discharged at a constant current of 0.01 mA, resulting in the decrease in voltage to 1.2 V, where the corresponding discharge capacity was 0.4 μAh . Figure 9d displays the charging/discharging curves of HEPD as a SC with a specific capacitance of approximately 0.5 F/cm2, when the fuel (ascorbate) and oxidant (O2) were absent in the anolyte and catholyte, respectively . The device was externally charged and then discharged, realizing excellent reproducibility for several cycles. The charging curves of the MSC array component are displayed in Fig. 10a, where the stored charge can be increased steadily with increased charging time, and the potential can be approximately 3 V in 117 min . Figure 10b illustrates that the voltage of the SCPC can be increased from 160 to 299 mV in 250 s when the device is under a compressive force of 34 N with a working frequency of 1.8 Hz. After the self-charging process, the device was discharged with a constant current back to its original voltage in 207 s under a discharge current of 3 μA . The self-charging capability of the five SCSPCs in series was tested under the continuous human palm contact to all devices, as displayed in Fig. 10c. Under continuous self-charging process, the open-circuit voltage can be increased from 160 to 280 mV (120 mV charged) in 350 s and is then sustained in 250 s, even after removing the deformation . The self-charging and discharging process of the fabricated device under continuous human finger imparting (at F ≈ 16.4 N, f = 1.65 Hz) for 80 s is illustrated in Fig. 10d. Although an initial voltage of approximately 130.1 mV was perceived, the device can be charged up to 281.3 mV from its initial voltage after repeated finger imparting. As a result, the device exhibits a distinct voltage increase of 151.2 mV. After removing finger imparting, the device was discharged back to its initial voltage in 145.5 s under a constant discharge current of 10.5 µA . More importantly, Pazhamalai et al. reported that the MoSe2 SCSPC device can be charged from 85 to 708 mV under an applied compressive force of 30 N within 100 s . By comparison, it is observed that the MoSe2 SCSPC device has better self-charging performance than the devices depicted in Figs. 9a and 10b. 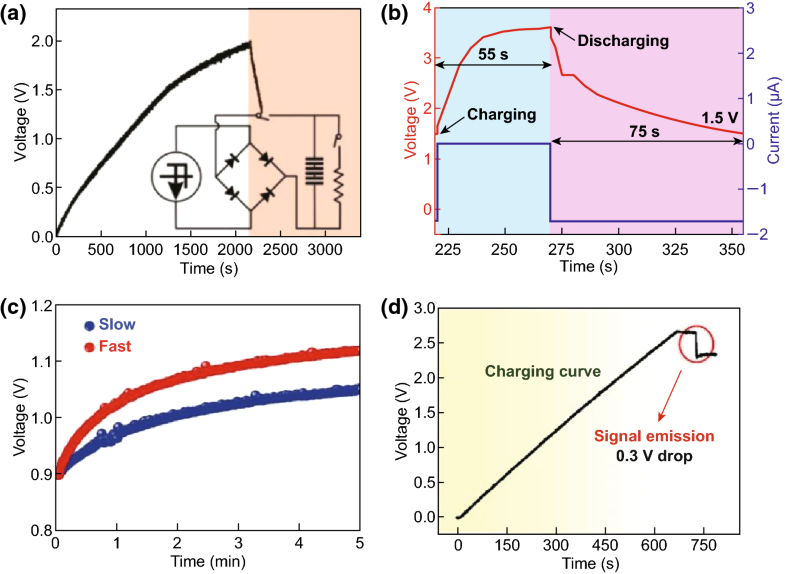 The excellent self-charging performance of the fabricated MoSe2 SCSPC devices might be related to intercalative type 2D MoSe2 energy storing electrode. As displayed in Fig. 11a, the SCPF was charged using different types of finger motions. For finger tapping, the SCPF was charged from 0 to 2.5 V within 6102 s (blue line) and discharged at 1 μA for 1639 s. When the finger motions are slow sliding (0.5 m s−1) and fast sliding (0.8 m s−1), the charging times can be shortened to 3518 s (green line) and 2094 s (red line), respectively . The following corresponding discharging at 1 μA can still be sustained in approximately 1630 s. Figure 11b presents the self-charging performance of the top Li-ion battery; it can be easily charged from 1.5 to 3.5 V in approximately 3 min under the vibrations of the FEP film induced by a wind blowing at a speed of approximately 10 m s−1 though the device . Figure 11c displays the voltage change of the F-DSSC, where it can be charged from 1.8 to 3.5 V in approximately 33 s using F-TENG . Figure 12a depicts the charging curves of the self-charging power system under the stable and fixed frequency of 5 Hz for the practical application. The circuit schematic diagram of the self-charging system is displayed in the inset of Fig. 4l. It requires approximately 2150 s to charge the EP-SCs to 2 V . The SLB can be easily charged from 1.5 to 3.6 V in approximately 55 s under the vibrations of the FEP film induced by a wind blowing with the speed of approximately 24.6 m s−1 though the device, as presented in Fig. 12b . 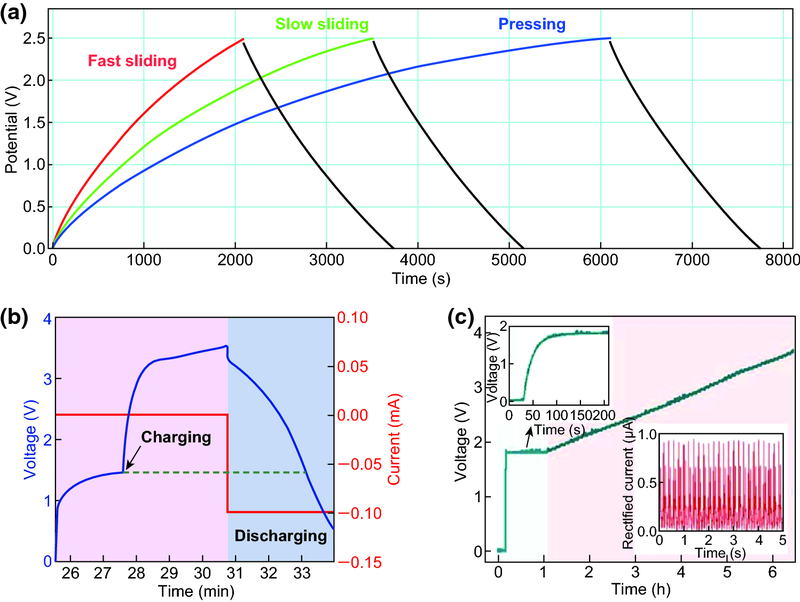 The convoluted power device in the human shoe under the fast walking condition can charge a Li-ion battery to a higher voltage of approximately 1.12 V in approximately 5 min as compared with that (1.05 V) under the slow walking condition, as displayed in Fig. 12c . Figure 12d presents the voltage–time curve of a PC-SCPU when charging and instantaneously working (charging frequency: 3 Hz), where it requires charging for approximately 60 s for wireless remote operation . The above research results indicate that the nanogenerator-based self-charging storage devices have good self-charging performances, which can push the practical applications of self-charging devices. The fabricated nanogenerator-based self-charging energy storage devices can be utilized as a power source for powering certain electric devices. The all-solid-state SCPC can power smartwatch, sports bracelet, and LEDs, as illustrated in Fig. 13a . Figure 13b presents that two lighted LEDs can be powered by the self-charging miro-supercapacitor power unit (SCMPU), where the SCMPU was inserted in the insole of a shoe to drive a commercial hygrothermograph . Operation of green light-emitting diode uses integrated SCSPCs in series as the power source, as displayed in Fig. 13c . Figure 13d illustrates that a calculator can be driven by the SCPF . Figure 13e presents that the twisted Li-ion battery can be used to light up a green LED . Moreover, it can be used as a power supply for small electronic wrist watch, commercial digital calculator, mobile LCD screen, and portable speaker (Fig. 13f) . As displayed in Fig. 14a, LED light signals of “FIB” can be lighted up by tapping a TENG bracelet wrapped around the wrist. Two SCs in series can be used to power the temperature–humidity meter and calculator . Figure 15a displays a self-charging power system, which can be used to power an electronic watch and a calculator at 5 Hz . 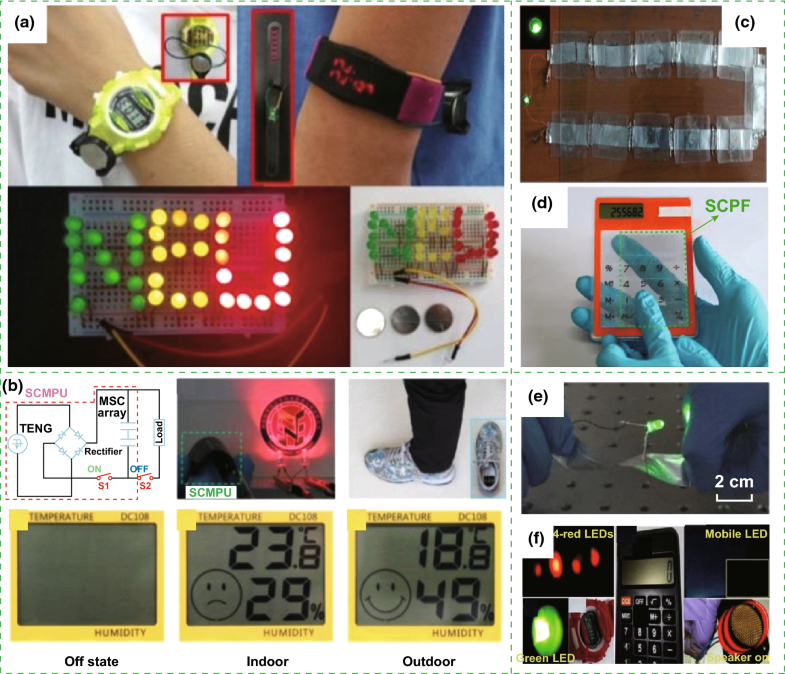 The fabricated all-in-one shape-adaptive self-charging power package in conventional wearable electronics and the integrated KP-SC (6 units, 3 devices in series) light up a single commercial green LED under cycling stretching movement, as demonstrated in Figs. 14b and 15b, respectively . Figure 15c displays a green LED that can be lighted up by the convoluted power device as an SLB , where a PC-SCPU-driven wireless remote control can be observed. Meanwhile, a PC-SCPU can be used as a power source for driving a digital electric watch and a temperature meter, as demonstrated in Fig. 15d . Thus, these devices have a wide range of potential applications in electronic devices and wireless sensors. Although significant improvements have been achieved, some problems regarding the investigations of nanogenerator-based self-charging energy storage devices are needed to be addressed: (1) Device life is a very critical matter in practical application. More attention needs to be focused on the device life to realize long-life devices. It may be necessary to start with material selection, structure design, etc. (2) LIBs or supercapacitors can be used for self-charging energy storage devices; the capacities and impedances of them should match the output of the energy-harvesting systems for higher conversion efficiency. Moreover, cost, safety, and easiness to integrate these devices are also one of the prior concerns. (3) The development of self-charging energy storage devices in future should follow the trend of miniaturization, diversification, integration, and portability. 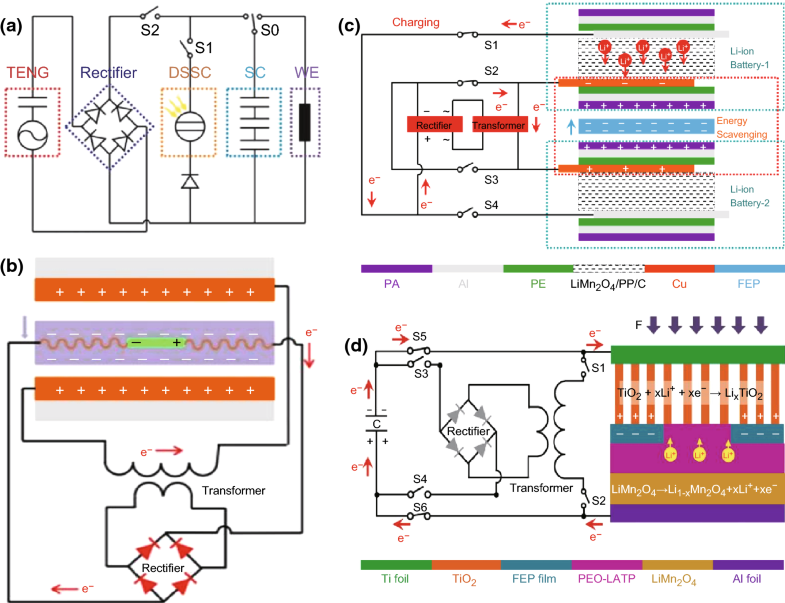 In summary, developing nanogenerator-based self-charging devices is one of the effective methods to solve issues of continuous energy supply of the next-generation microelectronic devices. A series of research results regarding scavenging and storing the mechanical energy has been obtained, but there are still several problems to be solved such as other energy scavenging and storage systems, device life. Owing to the unremitting efforts by a large number of researchers around the world, we believe that the self-charging storage devices will be extensively applied in our daily life in the near future, especially for wearable electronic devices and self-powered systems. The authors acknowledge the support from the National Key R&D Program of China (No. 2016YFA0202701), the National Natural Science Foundation of China (No. 51472055), External Cooperation Program of BIC, Chinese Academy of Sciences (No. 121411KYS820150028), the 2015 Annual Beijing Talents Fund (No. 2015000021223ZK32), the University of Chinese Academy of Sciences (No. Y8540XX2D2), Qingdao National Laboratory for Marine Science and Technology (No. 2017ASKJ01), the Shenzhen Peacock Plan (No. KQTD2015071616442225), the National Natural Science Foundation of China (No. 51504133), the Natural Science Foundation of Liaoning Province (No. 20170540465), and the “thousands talents” program for the pioneer researcher and his innovation team, China.